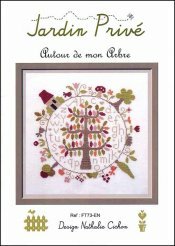 Autour De Mon Arbre [E6927] - $10.00 : Yarn Tree, Your wholesale source for cross stitch supplies. Cross stitch pattern by Jardin Prive. It's a beautiful bright autumn day, with the air like cider & the sky decorated in colors of orange, green & red from all of the leaves of the big maple tree. "Around My Tree," is the letters of the alphabet, making a circular shape. Listen to the sound of the birds singing their sweet melody & the aroma of the blooming flowers. Good bye summer, hello autumn! Stitch count 153w x 148h. Stitched on #2181 Zweigart Belfast Linen 32ct. Antique White.